Growing up in the south, we enjoyed our fair share of delicious food at church potluck dinners. 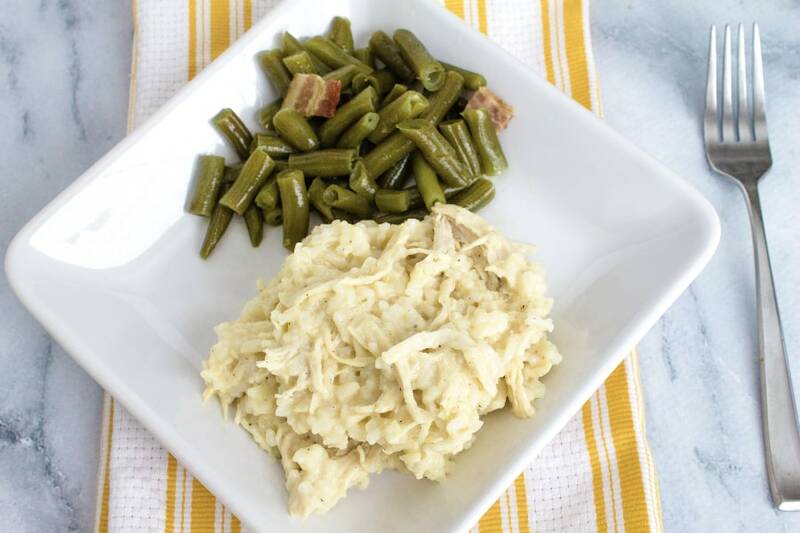 There was always a smattering of casseroles on the plastic tablecloth-lined tables that spanned the church’s fellowship hall, along with fried chicken, macaroni and cheese, southern style green beans, potato salad, and more. Casseroles have always held a special place in my heart, especially when they are creamy, delicious, and full of flavor. I mean, isn’t a casserole the ultimate comfort food? 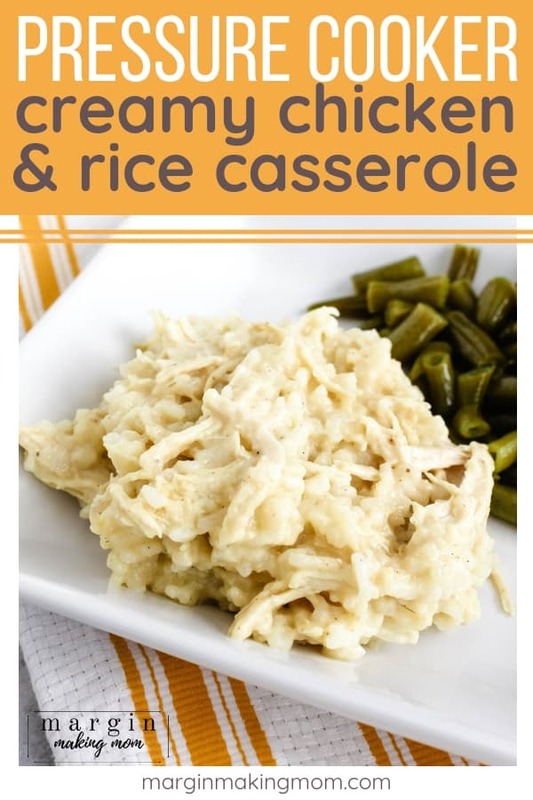 Chicken and rice casserole has been one of my favorites over the years, and while there are many different variations, they all are based on the same premise–white rice and tender chicken wrapped in a creamy sauce. Sometimes it’s topped with crushed crackers or cornflakes, sometimes it’s topped with shredded cheese that gets melted to perfection. 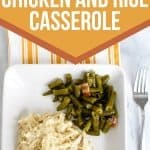 A few months ago, I came across this crock pot chicken and rice recipe from Julie at Back to My Southern Roots. If you don’t follow her already, you totally should–she has so many southern goodies on her site. 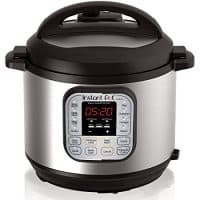 I decided to convert the slow cooker recipe into a pressure cooker recipe, and made some adaptations to the recipe. But let me tell you, the result was delicious! 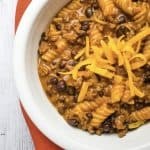 It’s so creamy and cheesy, and while it’s not exactly the “prettiest” casserole, it is a super tasty meal that your family is sure to love! 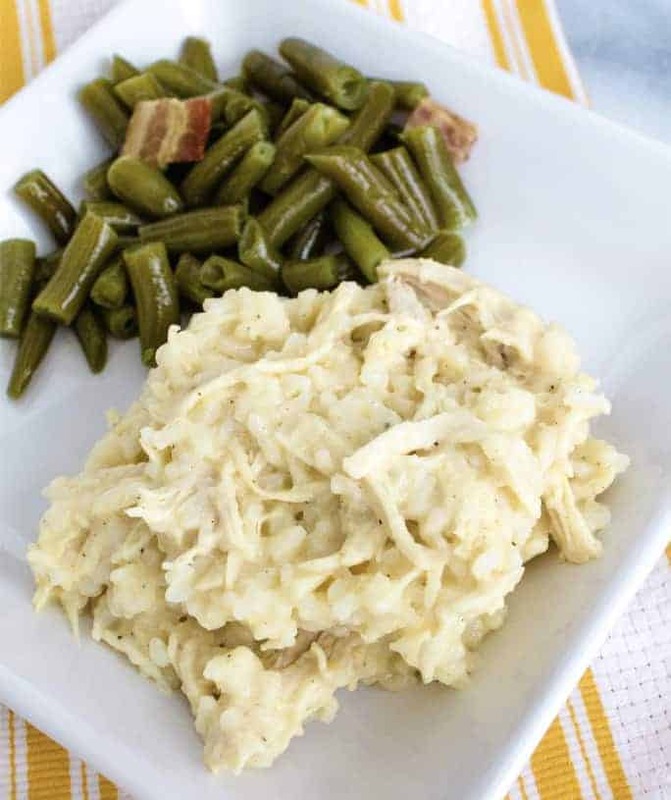 It’s perfect paired with southern style green beans and homemade dinner rolls (did you know you can use the Instant Pot to proof dough?)! You’ll start with a couple of boneless skinless chicken breasts. Cut them each into two or three uniform pieces and place them into the insert pot of your Instant Pot. Add in some white rice and chicken broth, along with some garlic powder, onion powder, and pepper. Cook that at high pressure for 3 minutes, then allow a natural pressure release. 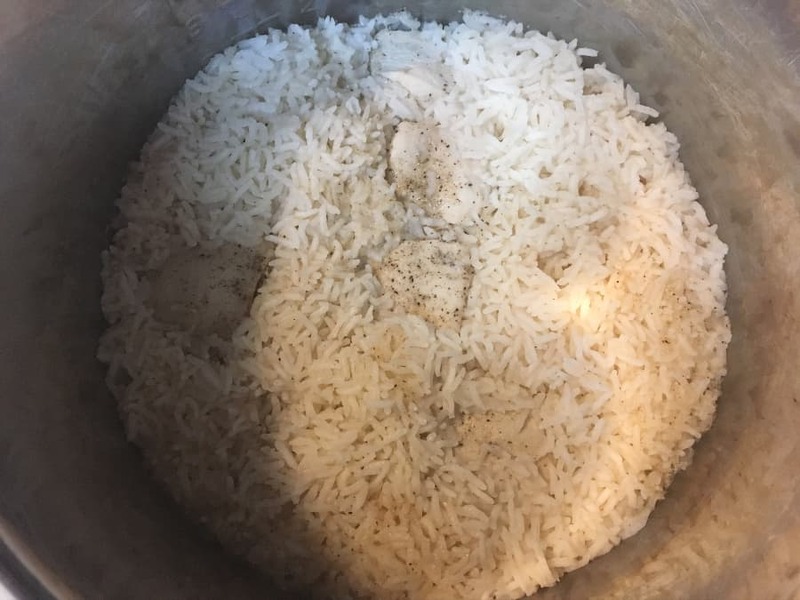 Once the pressure has released and the valve has dropped, remove the chicken and shred or chop it as desired, then fluff the rice and return the chicken to the insert pot. Stir in some cream of chicken soup until combined, followed by some shredded cheese. Stir until melted, and voila–dinner is ready! 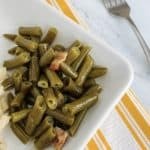 I served this with some southern style green beans, and it was a match made in heaven! I use homemade cream of chicken soup, because it’s a cinch to make and it really adds a lot of flavor. However, you can substitute a can of cream of chicken soup mixed with a can of water if you prefer. 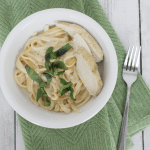 I liked having the shredded cheese melted into the chicken and rice, but if you’re counting calories, you can omit the cheese and it will still be very flavorful. 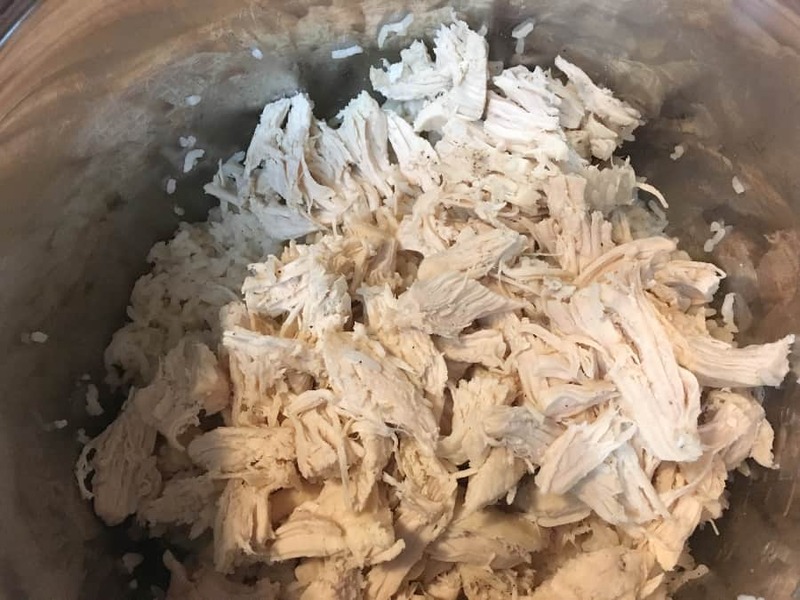 If you want to add a topping (crushed crackers, cornflakes, or cheese), just transfer the chicken and rice mixture to a baking dish after it has cooked, top as desired, and pop it in the oven until the topping is crisp or melted. Leftovers can be frozen! Just transfer any leftovers to a freezer safe container, cool to room temperature, and freeze. You can substitute pulled rotisserie chicken if you’d like (keep the cook time the same). I wouldn’t recommend using brown rice, because it takes a good bit longer to cook than white rice. The white rice has a similar cook time to the chicken, making them ideal to cook together. If you cook the chicken and brown rice together, the chicken will be overcooked by the time the brown rice is finished. You’d have to cook them separately, and that kind of negates the convenience factor of this meal! 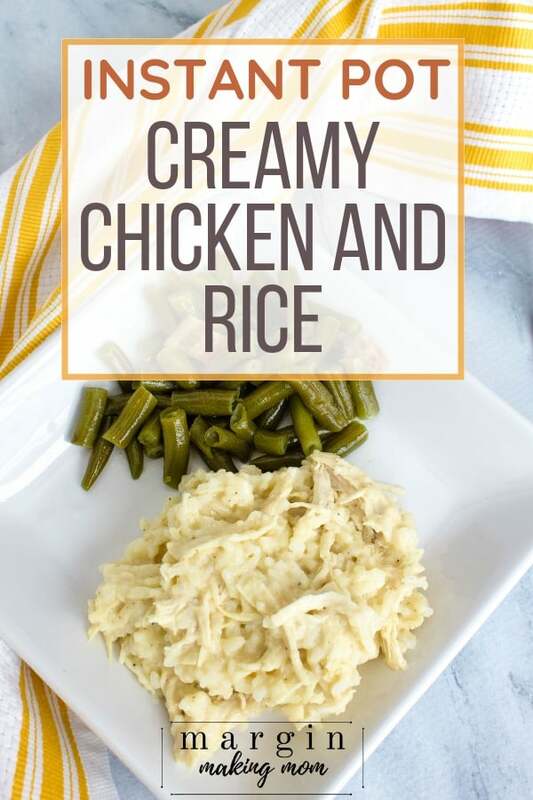 Instant Pot chicken and rice is your favorite creamy, cheesy casserole comfort food, except it's made faster and easier in the Instant Pot pressure cooker! 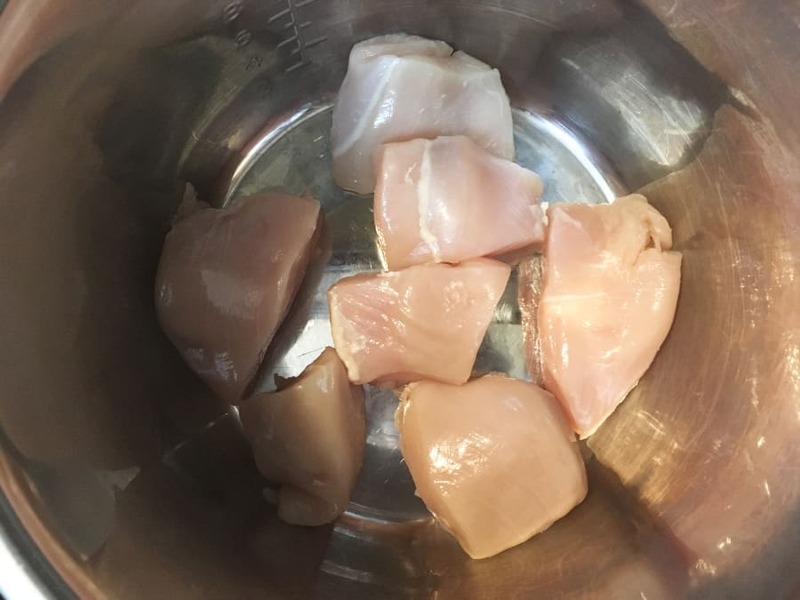 Place chicken pieces into the bottom of the insert pot of an Instant Pot. Top with white rice. Pour broth over the rice, ensuring it is covered. Sprinkle in garlic and onion powder, as well as black pepper. Place lid on Instant Pot and set the vent to the sealed position. Select a 3 minute cook time at high pressure using the Manual/Pressure Cook setting. Once cook time has completed, allow a natural pressure release. Once pressure has released and valve has dropped, carefully remove lid. 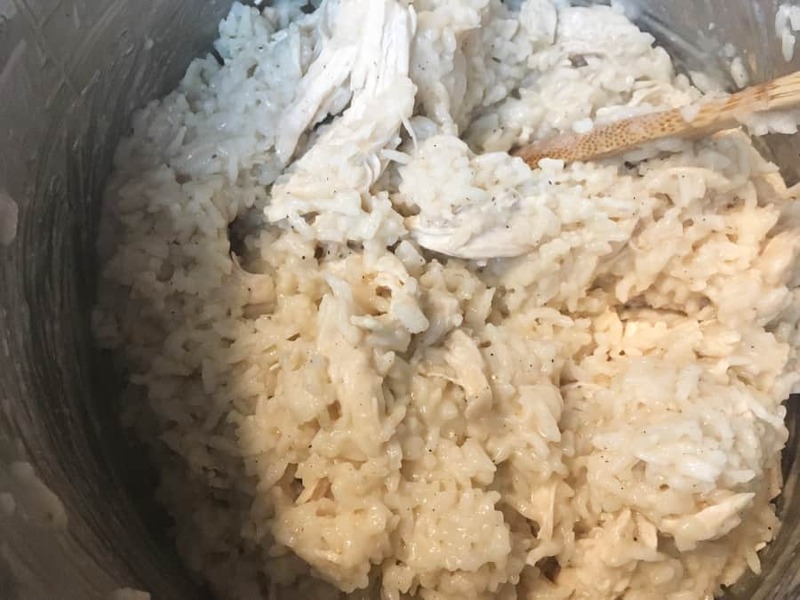 Remove chicken pieces and fluff rice with a fork. Shred or chop chicken as desired and return to the insert pot. Stir in the cream of chicken soup until combined. Then stir in 1 cup of shredded cheese until melted. 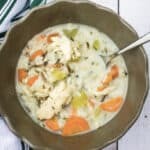 I use homemade cream of chicken soup, because it's a cinch to make and it really adds a lot of flavor. However, you can substitute a can of cream of chicken soup mixed with a can of water if you prefer. 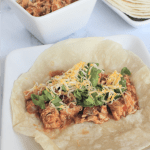 I liked having the shredded cheese melted into the chicken and rice, but if you're counting calories, you can omit the cheese and it will still be very flavorful. You can substitute pulled rotisserie chicken if you'd like (keep the cook time the same). I wouldn't recommend using brown rice, because it takes a good bit longer to cook than white rice. The white rice has a similar cook time to the chicken, making them ideal to cook together. If you cook the chicken and brown rice together, the chicken will be overcooked by the time the brown rice is finished. You'd have to cook them separately, and that kind of negates the convenience factor of this meal! It looks good! But I don’t like too much creamy. What can I do? Hi Joseph! 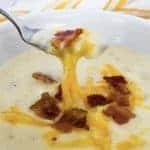 You can leave out the cream of chicken soup all together and just stir in some cheese at the end (and maybe some additional seasonings), or keep the soup in but leave out the cheese. I’d probably go the second route, personally, but either would still be good. So you don’t add any liquid before pressure cooking? Can you use frozen chicken and if so, how would that change the cook time? Can you use chicken thighs instead of chicken breasts?